Satisfy Speed with fast dinghy? What do you say about the following to get the high speed requirement in for trawler travels, just having a high speed dinghy? Doing the loop, or a long cruise somewhere, just find a good anchorage and park it, and use the dinghy to visit places around the area. With a "reasonably" equipped dinghy that can clip along at 25 knots one can see a lot. It would be perfect for "my" area on the west coast of Florida in Tampa Bay. If one parked on the ICW somewhere in the middle, the dinghy could get one up to Tarpon springs, and down to Ft. Desota or even down to Bradenton. Covering tons of neat little towns restaurants, sandbars, etc. Suspect the same for the Chesapeake Bay area or other area? Thoughts? And what is available in a perhaps 10 to 12 ft dinghy and motor that would get the job done. That's what we've gone to. We sold our slow rubber ducky and bought a 12' livingston with a 20 on the back (maybe move to a 25 one day). The shallow draft yet sharp hulls with high gunnels allow us to explore a range of environs. Our usual weekend is Friday after work: a 4 or 5 hour run in the big boat with dinghy in tow, anchor, have dinner. Sat and sunday, explore beaches, canals, creeks, etc/ fish from dinghy. sunday evening, putter back to the dock. There's also a bar across the marsh from us. the high speed dinghy makes dinner runs feasible. This is our toy for playing and quick runs for beer and shrimp! 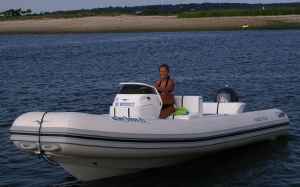 AB Nautilus 15 with a 60 hp Yamaha. Sits right inside our dock. 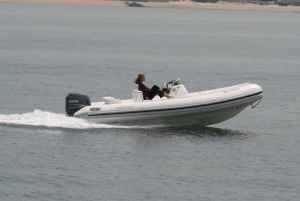 The tender is a Novurnia 11 with a 25hp Yamaha. That is exactly what we have done over the past 20 years or so. Over that tine we have had more than 10 RIBS of various sizes that we carry or tow (and in many cases both) with our larger boat. In the 10-12 size we have had an AB 10.5 with a 30 Suzuki , Zodiac YL-340 with a 25 Yamaha and a Zodiac YL-380 with a 40 Yamaha. OK Menzies, I have to ask: How fast does that nautilus go with a 60 on the back?? I have an 8.5' inflatable which I upgraded from a 2hp to a 4hp. It gets us around the anchorage, to and from our mooring and into town when we need it (typical dinghy). I was pretty happy with it until I borrowed my buddy's 10-11 ft with a 15 HP. Planing with 2 adult men opens a lot of opportunities. I don't have a 'need' for speed, but the convenience factor as a 'day boat' is undeniable. Well you see that is an interesting question! And even more interesting is; I don't know the answer to that! With me and the missus and dog on board with full tank (18 gallons) it runs along at around 30mph. However that is not the full story. The engine has a WOT of between 5000 and 6000 depending on how it is propped. My maximum RPM to date has been 4300. Why? See photo. Because a cup/phone holder was installed right in front of the throttle lever and that is where the engine maxes out when the lever hits the plastic. Now, I can easily remove one of the screws and let the holder hang there while I see what the boat can do, and even move the holder to the left a bit. But frankly in the six or so years I have had the boat I have never bothered to do that - 30MPH is more that comfortable for us. Easier on the engine and fuel too! That said. The missus just left this morning to visit our daughter in Montana for a week. I am going to be using the RIB for a bit of fishing over the next number of days. Maybe I will take a screw driver along with me and see what she can do! Having a fast dinghy has saved me on more than one occasion. 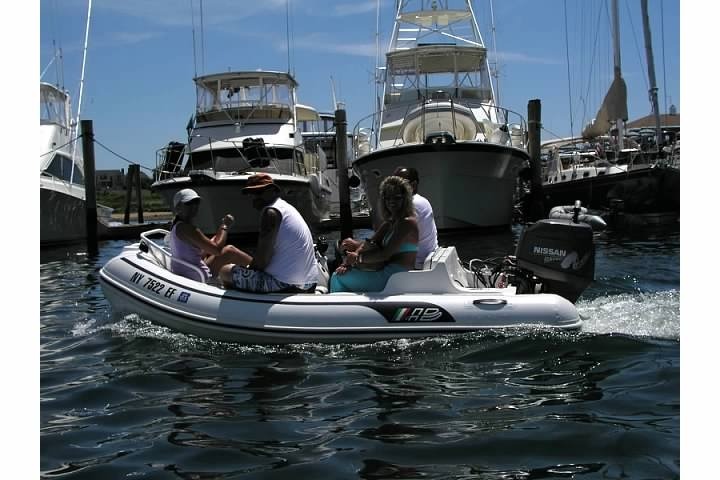 I've got a West Marine 310 RIB with a 2 stoke 15hp on it. With me and my family I can plane and get around 15kts. With just me I'm running around 20kts. I've used it to run from Jewfish Key to the northern tip of Anna Maria and back to pick up a part and have also used it to help push me off a sand bar in the big boat. There is a pretty easy way to look up the performance of most of these types of boats. 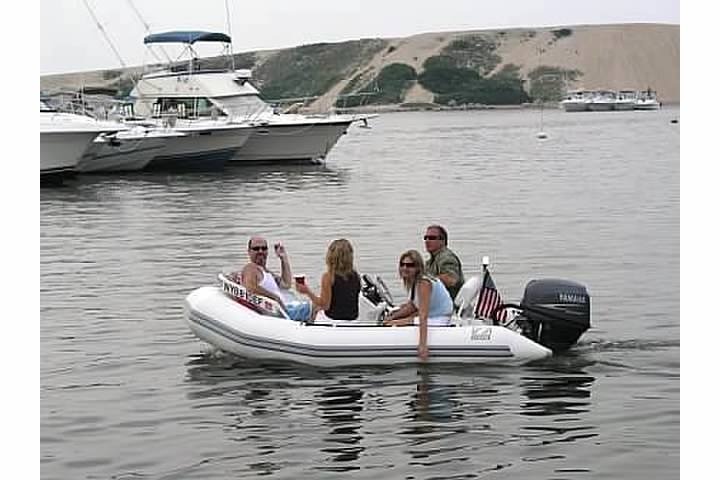 - Click on "Owners resources"
- Then select 'inflatable boats" / "all"
You will get a galley list of all they boats tested with the various engines in that category. Select one at a time and click on it and a detailed pdf review will come up with weight, speeds, acceleration, mpg, and propeller selection. Based upon my comparisons these tests are pretty close to what you will see in your use. 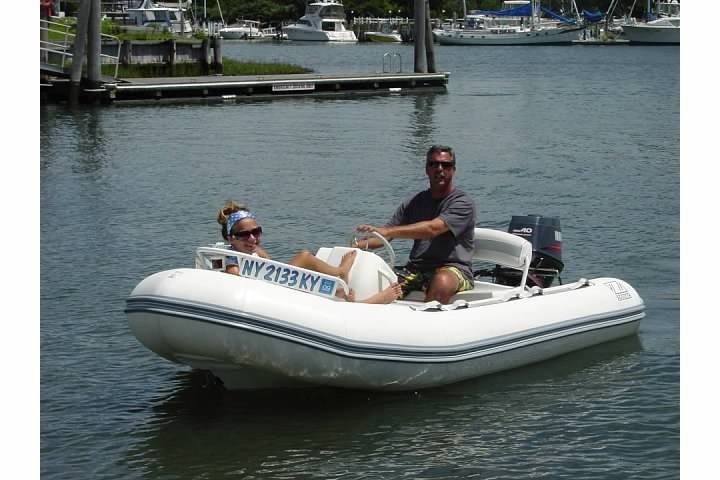 9'2" Highfield aluminum bottom RIB with 9.9 Yamaha 28knots (GPS) with one person, 23knots with two. Mine wasn't on there, just Avon and Zodiac. However there was a 13'9" zodiac with the 60hp. Looks like I might get around 36 max. Maybe a bit more. What year 9.9 Yamaha? Which prop are you running on the 9.9 engine? In my experience that is just about right and very fast for an inflatable in that size - you will feel like it is flying out of control above 30+. The 19'+ sizes get the same way above 50mph. Anything above 60mph requires at least 24 feet to make it feel reasonably safe on a RIB. I feel that once you are in the 30 mph range more or less you can do just about anything you want or need to do (supplies, explore, ski, dogs, etc) the larger sizes just add capacity and capabilities and cruise speed above 30mph. The thread could easily read "satisfy speed with small boats"
I do that. However all of my small boats are slower than my trawler except one. That one boat goes about 25mph. 18' open OB. The car has us more or less addicted to speed by familiarity. We started riding in cars from baby years on up. If we had never experienced the automobile going 8 knots may promote a comment like "I can't even run very far at that speed" instead of the comments that preceed this post like "8 knots are you kidding?" What you're used to pretty much controls what you do. Having grown up with classic Star Trek, I an **very** disappointed teleporting is not yet part of our daily lives. I'd settle for jetpacks and flying cars, jeez don't get me started. . . Agreed. Plus you are so close to the water that you really feel you are going fast enough at 30. My 11' Novurania with the 25 zips along but I don't get it anywhere near WOT. Around 2/3 throttle I can feel the boat "lighten" and wobble, any more and she starts to pull off sideways coming down waves. The PO added a big OB hydrofoil that may or may not cause this issue. 10 foot Bullfrog w 20hp Honda on Seawise davit goes as fast as I can stand. and an 8' Achilles, although it usually lives in its bag for lack of space on the boat deck.